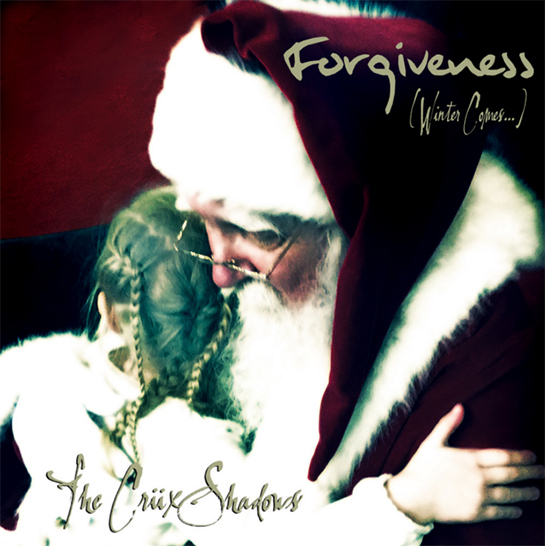 New Cruxshadows 2015 Holiday Song! I just saw Rogue (Lead singer of the Cruxshadows) tweet that they released a special holiday song. Every year our games do new special holiday events… but I never heard of a band doing it before. Apparently it is their 3rd year releasing an original song to pay tribute to the season. This year’s new song, Forgiveness (Winter Comes), is forlorn and beautiful. I will not ruin the songs meaning for you, but it is definitely my favorite of the three. I secretly slipped it into my home’s holiday music selection-- I am eagerly awaiting Trinni’s reaction when she goes, “Wait… what is this?” She will probably instinctively ask if it is Voltaire. Then I will explain, “No, no! It is the Cruxshadows.” followed by how this counts as official Holiday music and if she can have hers on the play list I should be allowed a few slots too. I mean, how many times can one man listen to that song about the guy trying to convince a girl to stay “...because it’s cold outside.”? The new song and all of the previous ones are available now on the Cruxshadows Website for a single donation of your choosing. Most of their fans give $5. Crazy mega fans go much higher to show their support. P.S. I was honored that the Cruxshadows appeared in our Anniversary event this year. If you did not know, we met the band and watched them perform many years at DragonCon. They agreed to do the event on short notice, with no compensation, on only a handshake-- just because they thought we were nice people and liked the creative things we are doing. So, when I saw the tweet I personally donated $25 and downloaded a copy of all the holiday songs, then I wrote this post for you to help spread the word. The song is called Forgiveness, but I am celebrating Gratitude. If you enjoy their style, and enjoyed the event, this is a nice way to give a little thanks to them directly. 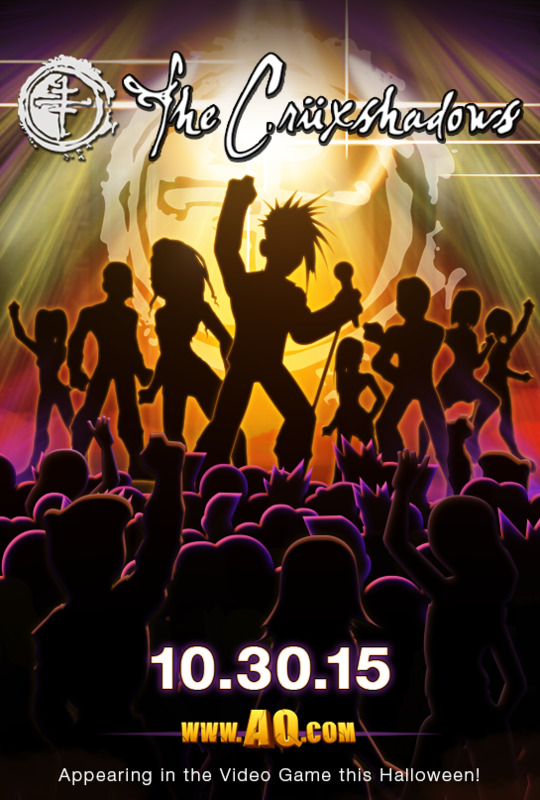 Mogloween 2015 Event Kicks Off With The ULTIMATE In-game Concert! The CrüxShadows, lead by lead vocalist Rogue, and their killer DarkWave sounds have captivated members of the AE team since we started attending Dragon*Con years ago... and now we are THRILLED to announce they'll be appearing in Concert in Darkovia on Octobe 30th to kicki off this year's 2015 Mogloween event! Before you smash, slice, and squash your way to VICTORY through the mayhem and monsters in Darkovia, The CrüxShadows will crank your energy levels up to 11 in the ultimate in-game concert! Make your way to Darkovia for the Grand Opening of Darkovia's FIRST EVER Scarbucks, and get your FREE promotional drink, courtesy of Khalu Bash's super-sweet, marketing-savvy master. This spicy-sweet drink will have all of Darkovia talking, so get in line while the drinks are still flowin'! Hands down one of the most popular Darkwave bands in the world, the Crüxshadows formed in the early 1990s in north Florida. Pairing lyrics that move the spirit and rhythms that drive the feet (and beat), their success has earned them "a near legendary underground status." They've played shows across the world, and were one of the first Western acts to play in Romania and Serbia following the Cold War. They were one of only a handful of Western alternative bands to perform at the Greenpeace Midi Open-air Festival in Beijing, China. They've produced over 18 CDs, a DVD, and countless compilations, plus have two Billboard #1 hits in the US (Sophia in 2006 and Birthday in 2007). It's easy to see the Crüxshadows have been slaying crowds for years, both in and out of the US -- AQW player xNightStormx tweeted: "@Alina_AE @ArtixKrieger CRUXSHADOWS ON AQW??? I'VE WANTED THIS FOR 5 YEARS. I'M CRYING RIGHT NOW. TEARS OF JOY." Here in the Secret Underground Lab, Artix, Nythera, and Memet are among the 'Shadows super-fans, but we are ALL just as excited as xNightStormx to have them guest start for Mogloween!